Can't Stop the Serenity, Joss Whedon's annual campaign to support the Women's Rights organization 'Equality Now', has launched for the 2019 season. The RISFC organized CSTS events in 2010 & 2011. There Was No Stopping the CSTS Signal in 2015! With the auction closing out the 2015 Can’t Stop the Serenity season in November, it’s hard to believe another year is over. But what a celebration our tenth year has been! 59 events in 45 cities across 7 countries raised over $90,000 for Equality Now and 19 other charities (you can view the full list of donations and charities on the Global Donation Tally page). A Virtual Shindig covered the globe and Sean Faust donated 50% of sales from his song Signal. We had a huge auction with over 50 lots including many rare collectibles and items signed by a variety of Whedonverse favourites. Finally a huge thank you to everyone who bid, donated, organised, attended, boosted the signal and volunteered for Can’t Stop the Serenity this year, we couldn’t have done it (or the last ten years) without you. We have done the impossible and that makes us mighty. More information about CSTS R.I. 2011! 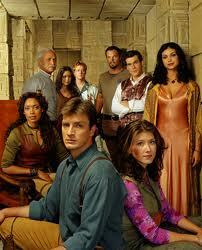 Doors open at 9 pm, and the fun starts with a Serenity/Firefly Costume contest. Wear the best costume in the 'Verse', and maybe win a prize! This year we're screening the fan-produced film, Browncoats: Redemption, starting at 10:30pm. The film takes place right after the events of Serenity, and features a new ship and crew. All the proceeds from the sale of dvd's of this film go to charities like 'Equality Now', and it's gotten great reviews by Firefly fans. 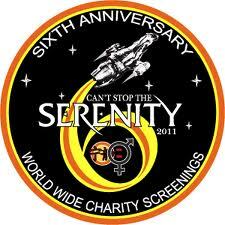 We'll be showing Serenity at Midnight. Please bring a non-perishable food item for the R.I. Community Food Bank, and you'll be entered for a chance to win some Serenity prizes! We'll also have several Sci Fi fan clubs represented at tables in the lobby.